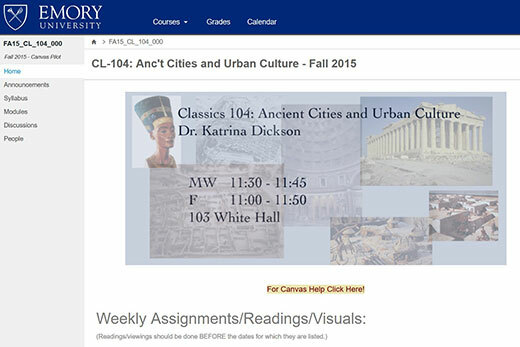 The homepage for the Ancient Cities and Urban Culture course. With the merging of Emory’s libraries and IT into Emory Libraries and Information Technology Services (LITS) two years ago, the Faculty Services name has changed recently to Teaching & Learning Technologies to better communicate the services that are available to Emory faculty. “We wanted to name ourselves something more specific to what we really do and what we focus on, which is supporting faculty teaching and pedagogical in-classroom work,” says Lee Clontz, manager of Teaching & Learning Technologies. • Learning Management continues to support faculty in the use of Blackboard and to administer that system, as well as assessing and supporting the Canvas pilot. • Instructional Technology provides support in a variety of disciplines, including instructional technology and design, electronic publishing and web/social media. • Academic Production focuses on video production, primarily for use on the Coursera platform, but also building best practices for academic video content on campus. • Software Distribution focuses on the management of electronic software licensing distribution. “We have faculty with a wide array of technology expertise. We have some who are experimental and want to do the latest thing, and really want to stretch technologically, so we want them to have people to talk to who are really smart about using technology in the classroom and can give them good advice,” Clontz says. Faculty who want to schedule an appointment with Teaching and Learning Technologies can send an email to classes@emory.edu. This semester, Emory is conducting a pilot of Canvas, a cloud-based learning management system (LMS), as a possible future replacement for Blackboard. “We’re evaluating Canvas as a potential substitute, but we’re still far away from having a final recommendation — it would take a long time and a great deal of campus coordination to make the switch away from Blackboard,” says Lee Clontz, manager of Teaching & Learning Technologies in the Library and Information Technology Services (LITS) division. About 20 faculty members have been trained to use Canvas for one of their fall 2015 semester courses, which involves around 650 students in the pilot. Faculty and students will provide feedback throughout the semester regarding Canvas’s functionality and ease of use. "There is a diverse collection of courses, class sizes, topics and schools involved,” Clontz says. Another 100 users, including additional faculty, administrators and others in the Emory campus community, will have “sandbox” accounts where they can practice using Canvas privately, outside of an enrolled course. The Canvas pilot team will have drop-in demo sessions, where the Emory community can learn about Canvas, try it out and ask questions. The demo sessions are every first and third Wednesday of the month through Nov. 18. The next session is on Wednesday, Sept. 23, from noon to 2 p.m. in Woodruff Library Room 217. Additional dates may be scheduled after November, Clontz says. In addition to the demos, the Canvas pilot team also plans to reach out to other Blackboard users not engaged in the pilot through departmental visits, presentations and Wonderful Wednesdays, then conduct surveys for feedback. Emory has been using Blackboard for more than 12 years. During that time, the LMS industry has made many changes and improvements, but Blackboard “has had a slow pace of innovation over the past several years,” Clontz says. Faculty members and students have complained about the “clunkiness” of the Blackboard user interface. “There’s not a lot of enthusiasm among our Blackboard users,” he says. Canvas was chosen for consideration after researching the feedback from peer institutions and consulting with them, Clontz says. The Canvas pilot team will analyze feedback from participants in the pilot, the demos and other outreach methods and present preliminary findings and a recommendation to IT and university governance by spring semester to assess next steps. Blackboard support will be unchanged while a decision is made based on feedback from the pilot. According to Kim Braxton, director of Academic Technology Services in LITS, if Canvas is approved, the transition to the new system is expected to take as long as four semesters, and would include an extensive communication plan, documentation, coordination and training for university faculty, students and staff. “After hearing frustration from so many faculty and students about the Blackboard platform, we are excited to have the opportunity to bring to the campus an alternative product to road test and assess,” Braxton says.